Domestic sales of gin are set to outstrip those for Scotch whisky by 2020, new figures have suggested. Data from the research company Euromonitor found blended Scotch whisky sales in the UK reached £1.28bn last year while sales of gin hit £1.07bn. However, by 2020 sales of blended Scotch are expected to drop to £1.17bn, with gin sales set to climb to £1.37bn. Scotland now produces 70% of the gin consumed in the UK, with more than 73 distilleries opening between 2010-14. The growth in the sector has been attributed to the increasing number of micro-distilleries, innovation and experimentation with botanicals and solid growth in the product across age ranges. Jeremy Cunnington, senior analyst at Euromonitor International, said blended Scotch was suffering from an image problem, while gin sales were booming. He said: "Blended Scotch continues to suffer from volume decline thanks to an old-fashioned and hence low-rent image, compounded by discounting. "Gin was suffering a similar fate, but the development of the super-premium category led by William Grant's Hendrick's brand and the rises of the craft movement and cocktail culture, has helped not only drive volume growth but also premiumise the category." Nick Smalley, director of Aberdeenshire start-up producer Teasmith's Gin, told the BBC's Good Morning Scotland programme that there was a lot to tempt people into gin production. 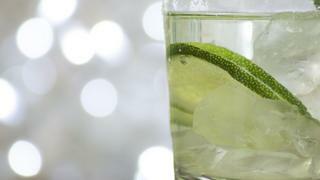 He said: "We've seen over the past couple of years that the gin sector has just boomed. It really has had a modern-day renaissance. "Gin in comparison to whisky is relatively quick to produce, so from our perspective we're able to get a product to market quicker than going after a whisky product - we're talking weeks rather than years." He added: "I think we've got a really broad customer base. So gin, as we saw in the 80s or 90s, was very much an older person's drink. I think the cocktail scene in the last decade has really inspired the younger drinker, so our customers range from anywhere from the early-20s into their 70s or 80s." However, despite the drink's growing popularity in the UK, producers say gin sales are dwarfed by whisky's overseas sales. Richard Woodward, editor of magazine Scotch Whisky.com, told the programme: "I think you also have to bear in mind that a lot of people making gin in Scotland at the moment will be making whisky. "It is a quick way of getting some revenue in to make gin because you have to wait at least three years for whisky to mature. So while you put that investment into the whisky you can be making some money to pay the bills through the gin. "There's a difference in scale and global reach between Scotch whisky and gin which we have to remember. "Only about 6% of Scotch is actually drunk in the UK in the first place and the industry is almost twice the size of the gin industry."